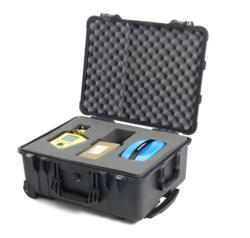 SKF has announced the availability of the SKF Marine Condition Monitoring Kit. This kit includes everything that is needed to carry out reliable, simplified condition monitoring onboard ships and enables ship operators to take a first step towards condition-based maintenance. “The SKF Marine Condition Monitoring Kit is easy to set up, use and understand and can give early indication of possible problems. It simplifies maintenance and reduces maintenance costs, says Anders Welin, Business Engineer, SKF Marine segment. With the SKF Marine Condition Monitoring Kit, even a non-trained user may interpret the results of vibration data measurements and locate the source of the fault in the machinery. The marine-specific software with marine typical equipment models is loaded in the SKF Microlog Advisor Pro and is preconfigured to convert the measured data into an easy-to-understand colour-coded result. The kit also includes a comprehensive step by step user guide to simplify the implementation and training of the crew. The SKF Marine Condition Monitoring Kit is more than a data collector as it has capability to do additional analysis of the machine, based on FFT (Fast Fourier Transform) frequency band analysis, to detect the most likely root cause of the fault, such as unbalance, bearing failures, gear failures, electrical failure in motors, hydraulic and aerodynamic problems. The SKF Marine Condition Monitoring Kit has been developed specifically for the demanding requirements of the marine industry and tough onboard conditions. It is well suited for use on a wide range of vessels, including container ships, ferries, Ro-Ro ships, fishing vessels, dredging vessels, tug boats and offshore supply vessel.